Standing in a field near Digboi in Upper Assam last week, I felt like I had finally reached the last link of the supply chain that joins tea growers in India to tea drinkers in the West. The field belonged to a smallholder farmer who had replanted with tea some years before having previously been a rice grower. With prices firm and a ready market available for his crop, he was delighted with his decision. Hanging from his shed was a giant poster, which summarized the new, restricted list of chemicals allowed by the new Plant Protection Code being rolled out by the Indian Tea Board. He was well aware that if any prohibited substance were to be found in samples from his production, his newfound prosperity would be at stake. Later on that afternoon we caught up with him at a bought leaf factory just a few kilometers away where 100s of smallholders regularly bring their crop for processing. His crop was weighed, graded for quality and added to the process – he was pleased with the deal and he would have his cash within a few days. Girls from the Namroop tea estate AssamThis operation is part of path finding work being done by ETP Regional Manager, Vikram Singh, under the auspices of the Trustea Programme and it was partly to check out this programme on the ground that I had made my journey to that remote corner of India. Some 30% of the Indian tea crop is grown by thousands of smallholder farmers and their share of production is increasing. Trying to bring them in line with the new code will not be easy but here is a model that seems to be working. The bought leaf factory invests in expert support and information for the growers and provides financial incentives in the form of price premia and end of season bonuses. The growers in return provide a regular supply of fresh leaf that keeps the factory turning and protect the factory’s reputation by using chemicals from the permitted list. The model requires factory owners with a willingness to invest in their upstream farmers but with food and drink consumers increasingly focused on product purity, it is clearly an investment with a very sound return. 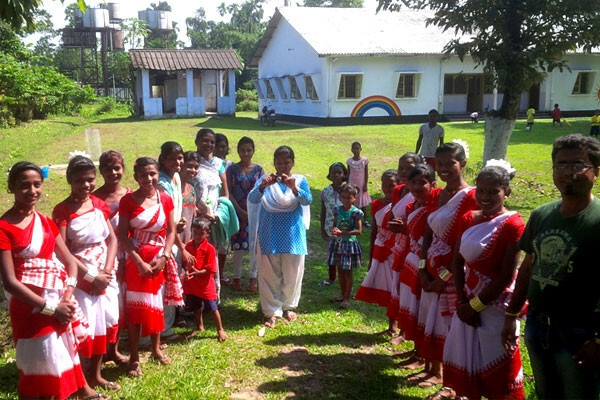 The following day saw us on the road to Namroop, an APPL owned estate in Upper Assam that has been working with UNICEF over recent years to set up a girl’s club in a project sponsored by ETP member, Twinings. It is partly based on their experience that we have now launched our new 3-year partnership with UNICEF focusing on improved protection for young women on tea estates in Assam. The girls met us at the gate, resplendent in their red saris, and explained how the club had changed their lives providing them with skills such as cooking nutritious meals, a better understanding of their rights (important this in a country where half of all girls are married before they reach 18) and, above all, a broader outlook on the possibilities that life may hold for them. Intensively nurtured by UNICEF in the early days, the club is now self-standing with over 160 members between the ages of 9 and 15. The problem, as I observed to the estate manager as we said goodbye to the girls, is that none of them want to stay on the estate and pluck tea, they all want careers as nurses or teachers. His reaction seemed to me to be the key to progress here, “we have to give them the opportunity and if we run short of people to pluck, then we’ll just have to speed up our mechanisation”. We read much these days in management books about creative destruction as the route to progress, well here it was in action in the most remote and unlikely place. I left looking forward to the roll out of ETP’s new program, reassured about our choice of UNICEF as our partner and increasingly hopeful about the impact it will have on the lives of thousands of children and young adults. And so back to Kolkata for a round of discussions with leaders of the main tea producing companies. The big issues in play for producers in Assam can be summarized as the three “Ps”: precipitation, pesticides, and people. Rainfall patterns have become much less predictable in recent years and this year’s crop has suffered as a result, likely be close to 10% down on 2013. Investment in water bodies and irrigation is becoming imperative in many areas if yields are to be protected. On pesticides, the new Plant Protection Code is now in place and producers are restricted to the new authorised chemicals list from next season onwards. There is plenty of concern about vulnerability to pest attacks and producers will need to assimilate new pest management techniques. There will almost certainly be some crop losses in the near term whilst things adjust. Investment in research to improve pest resistance and treatment regimes is being stepped up but will only provide solutions in the longer term. Meanwhile, the third “P”, people, is the most complex and important. Living conditions on Indian tea estates have had their share of negative commentary in recent times. Whilst it is clear that much needs to be done to improve living standards, this visit confirmed that the wheels of far reaching change are starting to turn. The landslide victory of the Modi government has brought a new sense of optimism that the country’s resources can be directed to more productive use and that tea growing areas, who voted heavily for the new government, will get a fair share of investment in areas such as sanitation and potable water, which are high on the new government’s priorities. In the near term, the triennial wage negotiation between the government, unions, and tea growers is nearing its conclusion. No one doubts that this will deliver a substantial increase in real wages from 2015 onwards. Although a significant step forward for many, this will also represent a big increase in the cost of production of which wages represent the lion’s share, and there are fears that more of the weaker estates will go under with consequent loss of employment – there are, it turns out, two sides to most coins. But probably most important for the future prosperity of workers in the tea industry is that they themselves have a growing sense that they have a choice about where they live and work. The girls at Namroop were certainly in no doubt about this. Despite their geographic isolation, mobile phones, satellite TV, and the Internet are penetrating tea communities and, along with rising educational standards, create a restlessness for better lives. I was impressed that many leaders in the industry want to work with this energy and invest in opportunities for their people, even at the possible expense of their own employment registers. They also know that future generations of tea workers will expect better living conditions on estates as part of choosing to stay. Of course, we should not be too rosy-eyed. The investment required in housing, education, healthcare, mechanization, and irrigation to create tea communities that are truly sustainable in the face of 21st century aspirations and conditions is enormous. Producers and government will both need to play their part. But I saw and heard enough on this visit to believe that change is coming. Let’s hope so, the members of the Namroop girl’s club are counting on it and we shouldn’t let them down.